In January of 1873, the Butz Brewery at the far north end of Walnut Street burned to the ground. 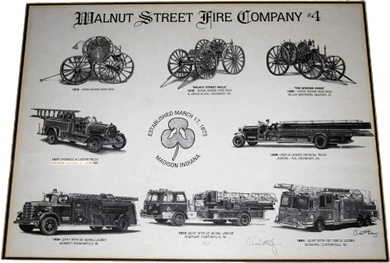 Residents of north Walnut became concerned about fire protection in their area of the town and, at a meeting held on St. Patrick’s Day, March 17, 1873, founded Walnut Street Fire Company No. 4. The minutes of that organizational meeting have been preserved and are kept in a fire-proof safe at the company’s current fire station at Walnut and Third Streets. In 1874, a lot was purchased at 808 Walnut and the company began construction of a firehouse that is on the National Register Of Historic Buildings, but is now privately owned. 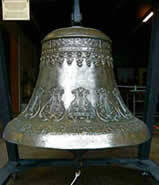 The following year, a 1,000-pound ornate, bronze bell that had been originally destined for a Mississippi plantation was purchased in Cincinnati and placed in a cupola atop the firehouse. The bell is on display on a special cradle at the current station. The original hand-drawn hose reel was replaced by a horse-drawn model named “The Walnut Street Belle” built in Cincinnati in 1879. The new reel proved to be unstable, often turning over when going around corners and it frequently needed repairs. In 1889, the company had a new hose reel constructed by the Miller Brothers wagon works located directly across the street from the firehouse. That reel was named the “Wooden Shoes” and the name and wooden shoes logo were painted on it along with the company motto, “When Duty Calls, It’s Ours to Obey,” by local artist William McKendree Snyder. The “Wooden Shoes” name emanated from some company members who wore wooden shoes for protection from the wet floors in a tannery where they worked. The shamrock, which is part of the present day logo, did not get adopted until the mid-1950s. In November of 1916, the Fours took delivery of the first motorized fire truck to go into service in Madison, a Robinson chemical truck manufactured in St. Louis, Mo. Washington Fire Co. # 2 had ordered an Ahrens-Fox motorized pumper that had arrived in Madison days before the Robinson, but which remained on a flat car at the railroad station when the Fours’ truck was driven into town. The Robinson was replaced in May of 1929 by an Ahrens-Fox city-service ladder truck with no pump which is on display at the current fire station. Ironically, the first line-of-duty death the company was to sustain occurred August 2, 1929 when member Peter Ike Hoagland ( who had driven the Ahrens-Fox from the Cincinnati factory to Madison ) was killed when struck by a car while running across the street to the firehouse to drive the truck to an alarm. The second line-of-duty death of a Fours member involved Bernard H. Kalb who died of a heart attack following a fire caused by lightning at Preston Paint & Wallpaper on Main St., July 6, 1966. 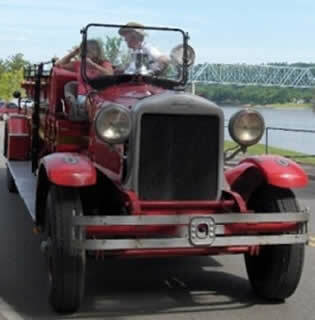 The 1929 Ahrens-Fox was replaced in 1954 by a truck built on a Diamond-T chassis by Boyer of Logansport, Indiana for Midwest Fire Equipment of Indianapolis. 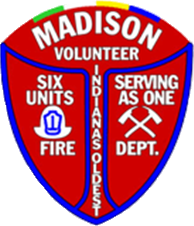 It featured Madison’s first aerial ladder, a 55-foot aluminum ladder that was electrically operated and the truck was the first of four aerial ladders that the company would purchase. It also was the last red truck that the company has owned. Pulling out and backing the long truck into a firehouse that was so close to the curb of a narrow street was extremely difficult for drivers so the Fours moved south to the present fire station at Walnut and Third streets in 1960. Most of the construction of the new station was done by the members themselves. The 1954 Midwest had become an operational and maintenance problem so it was sold to the Aurora Fire Dept. and was replaced in 1973 with a green Seagrave quint that featured an 85-foot, steel aerial ladder. The Midwest truck eventually found its way back to Madison and now sits rusting in a field near Kent. In 1994, the 85-foot aerial was sold to the Jefferson-Craig Volunteer Fire Department at Vevay where it has since been retired. The Fours replaced it with another green Seagrave quint with a 100-foot, rear-mount aerial. That truck was purchased by the City of Madison in 2007 to meet insurance requirements for a second aerial truck for the hilltop area and it now operates out of Clifty Fire Co. No. 6. The Fours currently operate a 2007 American LaFrance 100-foot aerial platform which required major modification of the fire station to accommodate its 12-foot height and 46-foot length. Although we are mindful of history and tradition, the Fours have been innovators down through the years, beginning as early as 1880 when we kept one person at the firehouse 24 hours per day in order to get the hose reel out promptly. In addition to operating the first motorized truck in Madison, we had the first and, until 2008, only aerial ladders. The company was the first to adopt the technologies of positive pressure ventilation and thermal imaging and was the first downtown company to use 5-inch, large diameter hose. We invite you to visit our station and to consider joining us in our service to the community as unpaid professionals.